Scenario is simple, to send file which is on Prem using SB Messaging adapter to Azure service bus queue and for that I created a queue using Azure portal under my ServiceBus namespace using the Quick Create option. Created a simple messaging application in Admin console with a receive location and a send port configured with SB adapter and properties pertaining to the queue which I created using the Azure portal. Got above error while sending message to Azure Service Bus queue. As mentioned in error "This client is not supported for a partitioned entity" , the destination is a partitioned entity -- the Queue and communication to this queue is not supported for client (BizTalk SB adapter). Whenever you create a queue using Quick Create option, the created queue will have partitioning enabled by default, so you can't send messages to those queue from BizTalk as of now. 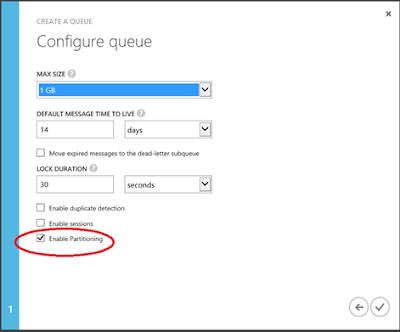 You need to create a queue which does not have partitioning enabled on it, but we don't have provision to do this with Quick create option so we need to use Custom create option. And as can be seen in above snap, Enable Partitioning property is checked by default, so I unchecked it and continued. After the new queue was created , I configured the send port as per new queue and tried sending message again, and yes it was successful.